One of the UK’s most successful female music ambassadors, Debbie is in demand as a composer and conductor. Throughout the past 20 years, there are probably few people in the UK who have not heard a theme from one of Debbie’s films or television productions. Whether it is watching Stephen Fry bring to life Oscar Wilde for the big screen, hearing the latest political commentary on a Sunday morning with Andrew Marr, or revelling in the Tudor world of Thomas Cromwell in “Wolf Hall”, Wiseman has gifted us iconic themes of beauty and passion, love and laughter. Her credits, over 200 of them, for the big and small screen, include WOLF HALL, EDIE, THE WHALE, FLOOD, WARRIORS, JUDGE JOHN DEED, WILDE, HAUNTED, OTHELLO, LAND GIRLS, JOANNA LUMLEY’S NILE, TOM & VIV, JEKYLL, THE INSPECTOR LYNLEY MYSTERIES, THE PASSION, THE GUILTY, BEFORE YOU GO, ARSENE LUPIN, HE KNEW HE WAS RIGHT, TOM’S MIDNIGHT GARDEN, LOST CHRISTMAS, STEPHEN FRY IN AMERICA, WPC 56, THE PROMISE, A POET IN NEW YORK, THE ANDREW MARR SHOW, FATHER BROWN, THE CORONER, SHAKESPEARE AND HATHAWAY and DICKENSIAN. Debbie has been nominated for two Ivor Novello Awards for WILDE and DEATH OF YUGOSLAVIA, and has won a TRIC Award for THE GOOD GUYS and an RTS Award for WARRIORS. She has been awarded the Gold Badge of Merit by the British Academy of Composers & Songwriters. In March 2016 she was awarded the Best Composer, Drama award for WOLF HALL at the RTS West Awards. 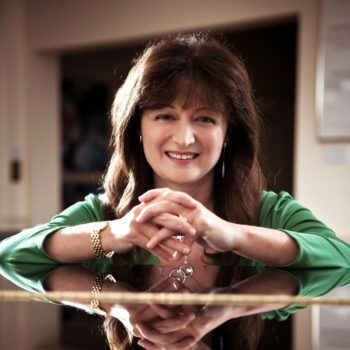 Debbie is a Visiting Professor at the Royal College of Music, and regularly gives masterclasses to schools and colleges about the art of composing music for picture. She has composed a new “Young Person’s Guide to the Orchestra” called “Different Voices”, and the work is now frequently performed by school and youth orchestras across the country. Her album of music to accompany the fairy stories of Oscar Wilde – WILDE STORIES, on the Warner Classics and Jazz label – was nominated for a Grammy Award and was then made into a trilogy of animated films for Channel 4. In Classic FM’s Top 100 Movie Music Chart, Debbie’s score for WILDE is regularly voted into the top 40 by the station’s listeners. A suite of her music from the film was included in the Great British Film Music Prom concert at the Albert Hall. As well as her composing work, Debbie appears in concert halls across the country conducting her film scores, and has been a regular guest conductor at the Royal Albert Hall’s annual Filmharmonic concert as well as appearing at the 2014 Cordoba International Cinema Music Festival, becoming the first female conductor in the history of the event . She has also appeared as an expert guest on the BBC broadcasts of The Proms. Debbie is a regular presence on Radio 3 and 4. She presented a Radio 4 programme on the composer Joseph Horovitz, and in 2013 Debbie presented Scoring Father Brown for Radio 4, which followed her process of composing the score for the BBC TV series. In October 2014 Debbie was Kirsty Young’s guest on Desert Island Discs, and in March 2015 Debbie presented Same Tune,Different Songon Radio 4, as well as a two-hour special of her favourite music on Radio 3’s Saturday Classics. Debbie was honoured in the Queen’s Birthday Honours list with an OBE for services to music. She was awarded Honorary Fellowships at both colleges where she studied, Trinity College of Music and the Guildhall School of Music and Drama, and an Honorary Doctorate at the University of Sussex. The CD album of Debbie’s original score for the acclaimed BBC series, Wolf Hall, entered the UK’s Classic FM chart at Number 1. Debbie was one of 11 composers chosen to compose music for the Queen’s Diamond Jubilee Pageant on June 3rd2012 when she conducted her movement of “New Water Music” on The Georgian barge. She was commissioned to compose the Overture and Finale music for the Queen’s 90thBirthday Celebration in May 2016. Debbie composed new signature music for Viking Cruises and in March 2017 was honoured to be appointed godmother to Viking Cruise’s new river ship – Viking Herja. Debbie is Classic FM’s Composer in Residence and her latest album “The Glorious Garden”, a collaboration with Alan Titchmarsh, topped the UK Classical Chart for three weeks.